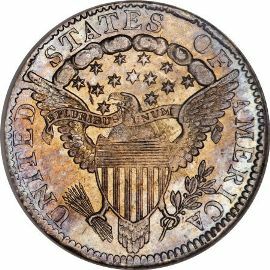 The Draped Bust Dime Heraldic Eagle variety was produced between 1798 and 1807. This coin was meant to replace the Small Eagle variety that was not widely accepted by the public. has a portrait inspired by Mrs.
William Bingham and was initially drawn by Gilbert Stuart. Mr. Stuart was a very well known artist at that time. 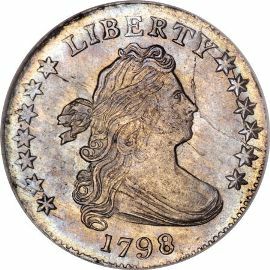 In 1797 the front of this coin was made with either 13 or 16 stars. the Great Seal of the United States. The other silver denominations of half dimes, quarters, half dollars, and dollars also have this reverse.